I can never have enough eggs on hand. They are such a great source of protein. 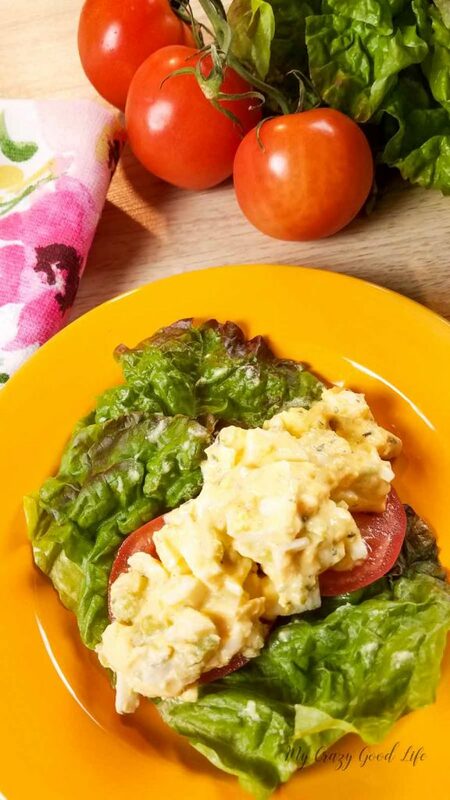 I hard boil with the Instant Pot, include them in salads, whip them up for breakfast dishes, and lately I’ve been using them in this delicious and healthy egg salad recipe. The great thing about this egg salad recipe is that you can make it with your Instant Pot, in the oven, or even in the Crockpot. There is no bad way to make this delicious recipe. You know I’m a fan of any recipe that lets me use one of my favorite appliances so I can set it and walk away to do other things. 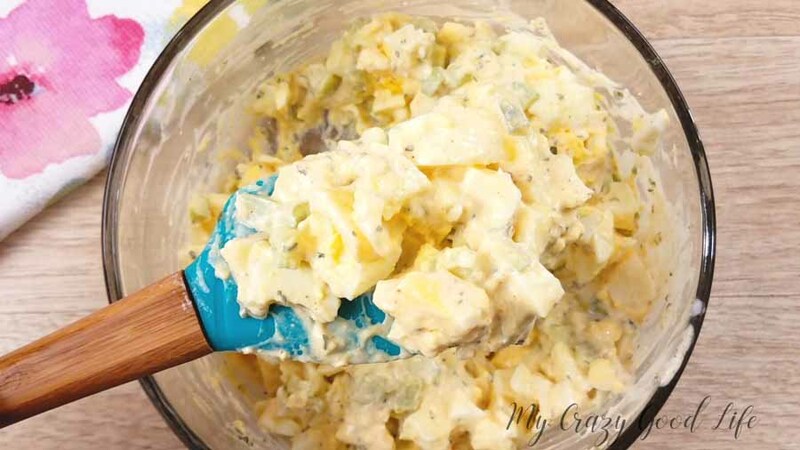 Let’s take a look at how easy this egg salad is to make. It’s quick and easy. Perfect for meal prep and lunches throughout the week or you can whip up a batch on those busy weeknights when everyone seems to be running in different directions. 1) Crack the eggs into an oven safe bowl that fits in the Instant Pot insert. Add 1 cup of water to the Instant Pot insert, then carefully lower the bowl of eggs to rest of the trivet. 2) Close the lid and turn the pressure valve to sealing. Cook on high pressure using manual for 6 minutes. Let the pressure release naturally. 3) Remove the lid and carefully lift the bowl from the Instant Pot. The bowl will be hot. Let the eggs cool to room temperature then slice the egg loaf into cubes. 4) Mix in the yogurt, brown mustard, celery, paprika, parsley, and salt. Chill in the refrigerator until ready to serve. 5) Serve over a few leaves of lettuce and tomatoes to make a wrap. 1) Preheat oven to 350 degrees F. Crack the eggs into an oven safe bowl or pan. Bake the eggs for 20-25 minutes, until the yolks are cooked all the way through. 2) Remove the pan from the oven and let it cool. 3) Slice the eggs into cubes. Mix in the remaining ingredients. Chill the egg salad. Serve over leaves of lettuce and sliced of tomatoes when ready. 1) Crack the eggs into an oven safe bowl that fits inside your slow cooker. Add 2 cups water to the slow cooker and place the bowl of eggs into the slow cooker. 2) Cover the slow cooker with the lid. Cook the eggs on high heat for 1 1/2 – 2 hours. When the yolks are set remove the bowl and let the eggs cool. 3) Slice the eggs into cubes. Mix in the remaining ingredients. Chill the egg salad until ready to serve. Serve over leave of lettuce and slices of tomatoes. 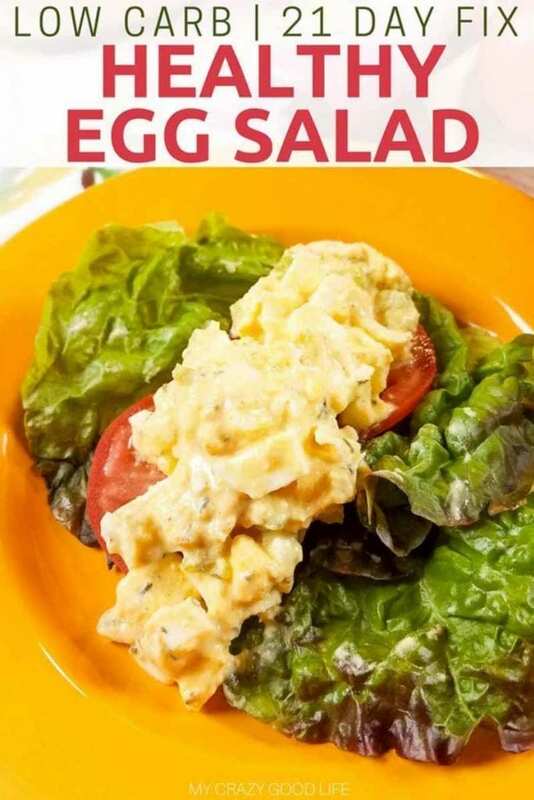 Don’t worry you can print this delicious and healthy egg salad recipe right here to keep handy. 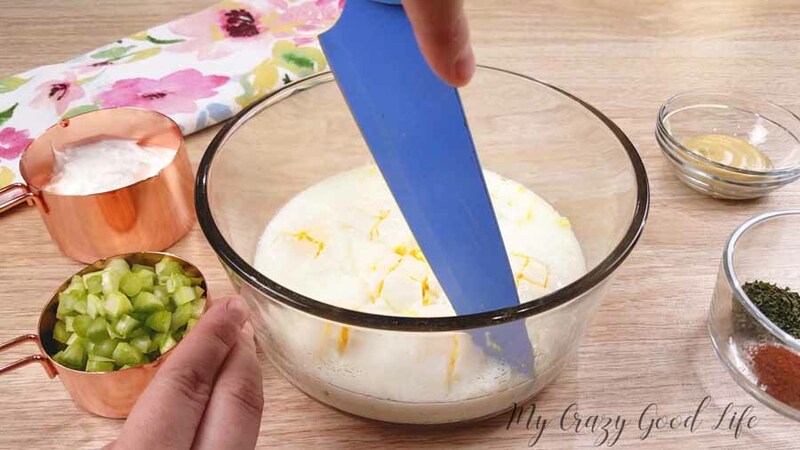 If you are still trying to use up some leftover hard boiled eggs this recipe is a must! I can never have enough eggs on hand. They are such a great source of protein. 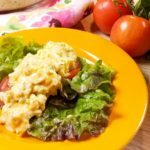 I hard boil with the Instant Pot, include them in salads, whip them up for breakfast dishes, and lately I've been using them in this delicious and healthy egg salad recipe. Crack the eggs into an oven safe bowl that fits in the Instant Pot insert. Add 1 cup of water to the Instant Pot insert, then carefully lower the bowl of eggs to rest of the trivet. Close the lid and turn the pressure valve to sealing. Cook on high pressure using manual for 6 minutes. Let the pressure release naturally. Remove the lid and carefully lift the bowl from the Instant Pot. The bowl will be hot. Let the eggs cool to room temperature then slice the egg loaf into cubes. Mix in the yogurt, brown mustard, celery, paprika, parsley, and salt. Chill in the refrigerator until ready to serve. Serve over a few leaves of lettuce and tomatoes to make a wrap. 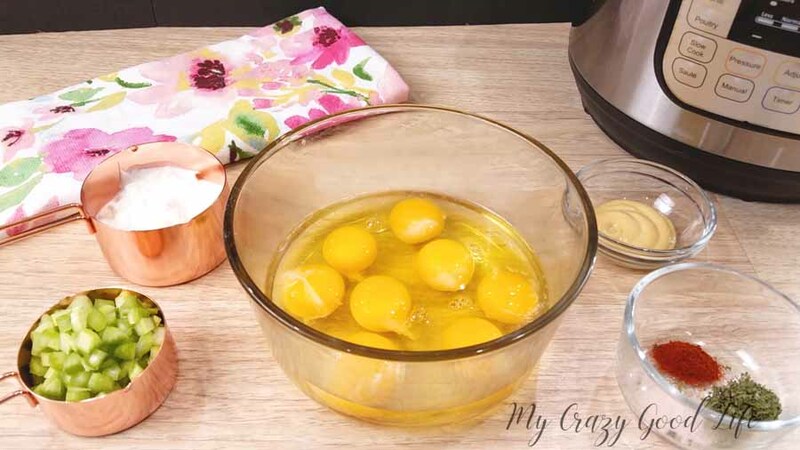 Preheat oven to 350 degrees F. Crack the eggs into an oven safe bowl or pan. Bake the eggs for 20-25 minutes, until the yolks are cooked all the way through. Remove the pan from the oven and let it cool. Slice the eggs into cubes. Mix in the remaining ingredients. 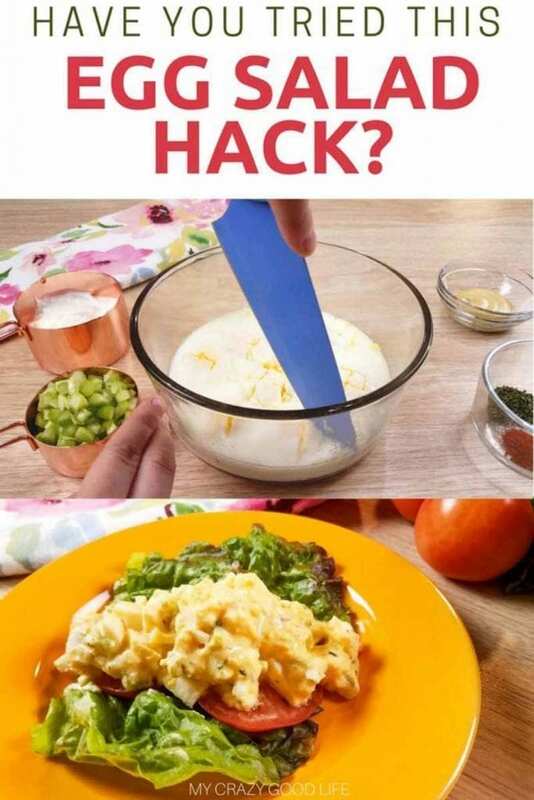 Chill the egg salad. Serve over leaves of lettuce and sliced of tomatoes when ready. Crack the eggs into an oven safe bowl that fits inside your slow cooker. Add 2 cups water to the slow cooker and place the bowl of eggs into the slow cooker. Cover the slow cooker with the lid. Cook the eggs on high heat for 1 1/2 - 2 hours. When the yolks are set remove the bowl and let the eggs cool. Slice the eggs into cubes. Mix in the remaining ingredients. Chill the egg salad until ready to serve. Serve over leave of lettuce and slices of tomatoes. Egg is my favorite and I can have it all day. Nice recipe!